Mechanical keyboard prices keep dropping and dropping. The latest miracle deal? The Cooler Master CK552, a fully RGB-backlit mechanical keyboard retailing for a mere $90—and often on-sale for far less. That’s even more affordable than the Cougar Attack X3 RGB, our previous “How is this possible?” recommendation. But as with anything in life, you (to an extent) get what you pay for. Let’s dig into the CK552, both its many strengths and a few noteworthy weaknesses. Cooler Master’s done a pretty great job designing an entry-level keyboard that still looks high-end. I’m incredibly impressed with the CK552’s aesthetic, which easily competes with keyboards twice its price. It’s simple but stylish, featuring an exposed brushed metal backplate and a minimalist rectangular shape with the left and right edges sloped slightly outward. Nothing fancy, but that’s exactly what makes it work. It’s a timeless, stripped-down style, right down to the simple sans-serif typeface used on the keys. Aside from the RGB lighting, the CK552 seems like it’d fit in at the office just as easily as the home, and would look great in either environment. It really is an entry-level keyboard though, lacking many of the frills I typically look for these days. There’s no wrist rest, for instance. Cooler Master sent us its WR530, a large rubber wrist rest that pairs fine with the CK552, but it’s not a pack-in item. Those who bring their own wrist rest (or don’t use one at all) likely won’t mind, but it means the CK552’s not quite as budget-friendly as it first appears. Don’t buy this wrist rest unless you love smelling like tires. The CK552’s cable is thin and fragile-feeling, which is perhaps my biggest complaint here. I prefer detachable cables, and failing that, I prefer a thick and robust, fabric-shrouded cable with heavy-duty strain relief like the ones we find on Razer and Corsair products. The CK552 is plain ol’ rubber, and attaches to the keyboard with a delicate-looking nub. It doesn’t feel like it’d hold up to much abuse, and I wouldn’t recommend throwing the CK552 into a backpack or anything very often. It also lacks dedicated media keys. That one’s less surprising at this price point, but worth noting for anyone who’s grown accustomed to them. Media keys are double-mapped to the Home block instead, with volume controls on Page Up and Page Down. It’s not my favorite placement, though I was able to use them one-handed at least. Why not put the media keys on the Function row? Well, the CK552 loves double-mapped commands. It’s absolutely full of them. F1 through F4 allow you to adjust the backlight color, F5 through F8 let you change lighting effects on-the-fly, F9 through F12 allow for macro recording and disabling the Windows key, 1 through 4 on the number row let you switch profiles, and the arrow keys also adjust lighting effects on the fly by speeding them up or slowing them down. Point being: You have a lot of control, all without the need for software. Those who are tired of every peripheral being tied to a software utility will probably be excited, though the bevy of secondary commands (and even tertiary) does leave the CK552 looking a bit cluttered. If you do decide to go the software route, Cooler Master’s utility is pretty simple and intuitive. And at 64MB, it’s also one of the most lightweight programs I’ve seen for peripheral management. Kudos to Cooler Master for that. Inside you can do all the usual tweaks, from per-key backlighting to general effects, macro recording, key remapping, and profile management. 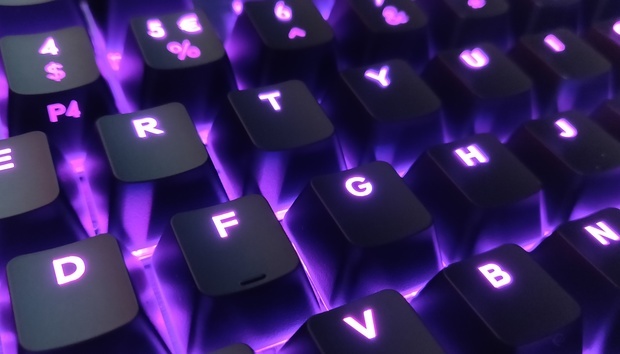 The CK552’s backlighting is the standard Cherry MX-style, with a single RGB LED placed at the top of each key and refracted through a translucent switch chassis. It’s not the most elegant solution, but Cooler Master makes the most of it. The CK552 is vibrant, with excellent color accuracy—though like any Cherry-style board, the light does tend to fall off as it approaches the bottom edge, most noticeable here on the Cooler Master logo and any double-mapped keys. You’ll also notice I keep saying “Cherry-style.” Yes, like many modern keyboards—especially entry-level ones—Cooler Master’s opted for a Cherry-compatible competitor, in this case Gateron. It makes sense. They’re cheap! But as far as cheap competition goes, Gateron’s are actually a pretty great deal. The CK552 I’ve been using is built around Gateron Reds, a Cherry MX Red clone. Gateron Reds feature the same linear action, the same 45 gram force requirement, and are generally smoother-feeling than Cherry MX Reds—though you’d probably have a hard time noticing in a standard typing environment. They’re well-regarded by mechanical keyboard enthusiasts though, and if you’re going to deviate from Cherry then Gateron is an excellent call. That said, the CK552 is loud. I don’t have another Gateron Red board to compare to so it’s hard to say whether it’s a result of the switch itself or the CK552’s construction—though I’m leaning towards the latter. A lot of people choose Red switches because they’re quieter than the tactile Browns and Blues, but the CK552 is almost as loud as some of the MX Blue keyboards I type on. Each stroke hits the backplate with a hollow thunking noise that can be distracting even for me, a longtime mechanical keyboard user. If you’re looking to buy a CK552 with Reds because they’re touted as “Silent,” just know this particular model is anything but. Cooler Master’s got a pretty sweet entry-level board on its hands though. Sure, $10 or $20 more can get you the Cougar Attack X3 RGB, which has a more traditional placement for its media keys, a pack-in wrist rest, and Cherry MX switches. But the wrist rest is the only feature I truly missed while giving the CK552 a spin, and that’s easily remedied with any number of third-party options (or Cooler Master’s, if you can stand the smell). Not to mention the fact that the CK552 is a lot prettier than the Attack X3’s faux-industrial look. Forget fans. Maybe Cooler Master’s got a new niche.